This auction is loaded with just a little bit of everything from graded cards, programs, Guy's Pins, autographs of Chiefs and Royals from icons like George Brett, Buck O'Neill, Mickey Mantle, John Wooden to the phenom Patrick Mahomes II! There is a little bit of everything for everyone with bobble heads, vintage Guy's Pins from the 60's, original Kansas City Athletics Scorecards, advertising pieces, 1985 & 2015 World Series items, must look through every item as there is quality items all the way until the end of the auction! Kansas City Royals Locker Room Celebration Champagne Bottle Used In Locker Room American League Divisional when the Royals Defeated Astros 3-2. This bottle was used in the locker room when the Kansas City Royals beat the Astros in 2015! This bottle was purchased directly from the Royals and after they were collected after the celebration they were then etched with the American League Divisions Logo and the Royals vs. Astros 3 games to 2 games! It's an extremely unique piece of Royals history and who knows who's hands this passed through during the celebration! The full bottle of champagne is over $200.00 when full, but is an empty bottle used by the Royals in the locker room after clinching this round of the playoffs in 2015! Signed Buck O'Neil 8x10 July 28th, 1995 John "Buck" O'Neil Appreciation Day Photograph KC Monarchs! This is from a personal collection of a client that we are selling most of his personally collection! The majority of these autographs he has owned for decades and has gotten them personally and they have been displayed prominently in a cool, dry place that protected the autographs boldness! The photo comes in a very nice wooden frame and glass for easy display that only adds to the protection of the piece! This item will pass any third party authentication according to my expert opinion! Several items from this collection were given to PSA/DNA this weekend and passed without question for authenticity! Signed George Brett 3000th Hit Commemorative Souvenir Program! This program has a facsimile signature, but the darker black signature is actually signed by George Brett himself! It will pass any third party authentication service! Signed John Wooden Photograph Legendary UCLA Bruins Head Coach 100% Real Authentication by PSA/DNA Encapsulated! This photograph from the UCLA Bruins is of legendary Head Coach John Wooden and is a great, perfectly bold signature of the Hall of Famer and father of modern basketball! The actual photograph measures about 4x6, but encapsulated for protection and authentication, the entire piece is about 10 inches by 6 inches! It's a great display piece for any basketball fan and this is the first one I have auctioned and the first I have owned in over a decade! Mickey Mantle Framed 11x14 inch Framed Sepia Toned Picture from 1960's! The picture is from the 1960's, but these photos were made readily available in sepia tone in the 1980's! Comes in a nice black metal frame for easy display! Signed Christian Colon Official Major League 2015 World Series Baseball w/ James Spence Authentication Witnessed! This was personally witnessed by a James Spence Authenticator and is 100% real! Colon is the 2015 World Series hero when he got a hit in extra inning of Game Five and got the game winning RBI in the clinching game of the World Series! It's a must have baseball for any true Royals fan! Signed Justin Houston 16x20 Photograph Kansas City Chiefs #50 w/CJ Sports Authentication 100% Real! Signed Wade Davis 16x20 inch Glossy Photograph Kansas City Royals 2015 Postseason Authentic MLB Photo with MLB.com Authentication! 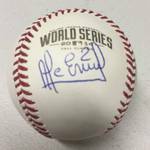 This item is a must have for any Kansas City Royals fan as it's from the 2015 World Series run and signed by the pitcher that was on the mound when they closed out the World Series! This is 100% real and signed in silver ink! Full Sized Jorge Bonifacio Signed Baseball Bat w/ James Spence Authentication Blue Ink Kansas City Royals! The bat comes with a Certificate of Authenticity from JSA or James Spence Authentication that is from one of the best authenticators in the industry! It has the card in with the bat and the JSA sticker on the knob of the bat as well and you can look up it's authentication anytime you want at James Spence website! It was signed during a private/public signing last year and it's 100% real! Signed Bobby Bell Kansas City Chiefs Mini-Helmet w/ "HOF 83" Inscription Chiefs & NFL Hall of Famer! This was obtained in person by a long-time customer and decided to sell it since it was a duplicate for him! This is authentic and will pass any third party authentication! Signed Jan Stenerud Kansas City Chiefs Mini Helmet With "HOF '91" Inscription Signed in Silver Ink with Authentication! The authentication is from when Stenerud did a public signing at the Book Barn and will pass any third party authentication! Signed Derrick Johnson #56 Kansas City Chiefs Mini Helmet New In Box! This was personally signed by Derrick Johnson and will pass any third party authentication process! Signed Lorenzo Cain #6 Kansas City Royals Professionally Framed Poster 24 inch x 24 inch w/ MLB Certifcation 100% Real! This was purchased directly from the Royals and it's officially licensed by both the Kansas City Royals and Major League baseball! The signature is 100% real and it has impeccable authentication through Major League baseball itself and the MLB.com/authentication website! It's a great piece of one of the most important parts of the back to back World Series runs and 2015 World Championship! Original 1975 Topps George Brett Rookie Card Kansas City Royals in 1/2 Inch Acrylic Protective Case! The pictures show the condition of the card and it's doesn't have any creases or major problems! Original 1953 Bowman Color Stan Musial Baseball Card In 1/2 Inch Acrylic Holder High Book Value $600.00! This card is not the high end of conditions, but it's a nice affordable example of the extremely rare 1953 Bowman Large Color Stan Musial! I tried my best to show the condition issues of the card in the pictures! With a high book value of $600.00 this is a way to add this iconic card to your collection without missing a mortgage payment! Original 1953 Bowman Color Whitey Ford New York Yankees Baseball Card In 1/2 Inch Acrylic Holder High Book Value $800.00! This card is not the high end of conditions, but it's a nice affordable example of the extremely rare 1953 Bowman Large Color Whitey Ford! I tried my best to show the condition issues of the card in the pictures, but it only has the one major crease! With a high book value of $800.00 this is a way to add this iconic card to your collection without missing a mortgage payment! Signed Lamar Hunt Kansas City Chiefs Owner Football Card Encased & Certified 2012 Leaf Sports Icons #2 of 3! This card was produced by the Leaf Trading card company and encased and authenticated by Beckett Grading Services and there were only THREE of them made and this is #2 of 3! It's a great piece of the Kansas City Chiefs founder and owner Lamar Hunt! It's the size of a regular sized football card, so the autograph takes up almost the entire front of the card! It's a great piece of the NFL Hall of Famer! New In Box Salvador Perez 2015 World Series Champions Gatorade "Salvy Splash" Bobble Head Bobblehead! There is a slight bend in the box shown in the second picture, but the bobblehead itself is not damaged in any way! Original 1974 Kansas City Royals Official Yearbook! There is a little wear on the front shown in the pictures, but it's a great piece from almost 45 years ago! Complete 2015 Topps 5x7 inch Kansas City Royals Team Set Only 99 Sets Made - Only Available Directly From Topps! You get all 9 cards in this set that is a reprint of the 1987 Topps set design! There were only 99 sets produced and this is #13/99 with each card numbered #13/99! This is Salvador Perez's jersey number as well, so it adds a touch to the set! You get all 9 cards in the set and all 9 cards shown in the pictures! These were only sold directly on the Topps website for a very short time and were only available until they sold out all 99 sets! George Brett Kansas City Royals Poster 1991 Signed By Artist Keely and Only 500 Made #29/500! Poster/Print is approximately 18 inches by 30 inches! 1986 Kansas City Royals Print "Memorable Moments in Royals History" Original Print! The Print still has the original gold seal, but has a beautiful picture and would display very nicely! It's embossed with the IBM logo and the Royals logo and is in very, very nice condition with no major issues that I can see even though it's 30 years old! Then it's completely folded out it measures about 22" x 14" so it's a big nice piece!